Just before I head off to "The Desert"!! Well, here I go, ready or not! On Friday I'm getting on a plane bound for Abu Dhabi & I still have so much I really should be doing...not least of which is filling a total of 46...yes, 46 jars with differing things like gherkins, onions, peaches, cherries ....the list goes on!! I have, at least, sourced the jars, but to be quite honest the thought of starting to fill them all is NOT filling me with enthusiasm!! 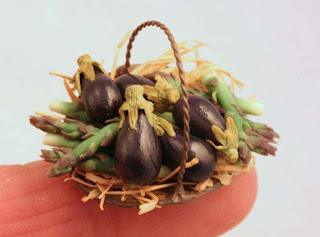 I have been desperately trying to clear my workshop of all my "UFO's" before I leave & one of them was a basket that consisted only of some straw & a few asparagus spears! As I had been working on asparagus, I forced myself to finish it with the addition of some aubergines! Well worth the effort...I just LOVE it & I really can't make up my mind whether or not to put it up for sale as I just know that I probably won't force myself to make more fiddly asparagus for another couple of years! The English Asparagus Season Is Here!! At last..the English Asparagus season is here! No other asparagus has quite the same flavour as ours. Sadly, the season lasts only a matter of weeks, so you have to get it while you can & I did!! I have to say that it is one of my favourite veggies & before I ate mine, I just had to make a mini version...as usual!! 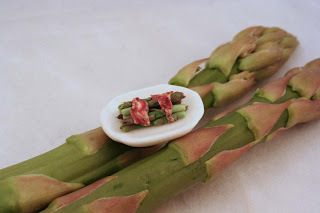 This "little" example is simply steamed ( & did you know that you must always steam aspargus standing upright in the pan?!) & served with crisply fried British bacon...yum..I can't wait for the "real" version later tonight!! It's not quite the lobster thermidor that I've been threatening to make..but at least I'm in lobster mode, so possibly sometime in the next few days I may just have a mini version of my favourite dish in the whole world to show you! 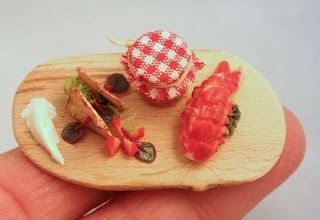 In the meantime here is a mini representation of a lobster that I was served in the Michelin starred restaurant at Seaham Hall. It was delicious! 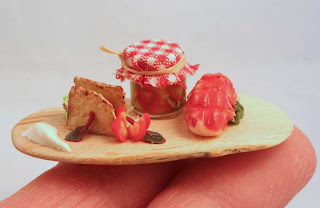 The lobster was so tender & tasty & served with melba toast, salad & baby beetroot leaves, a dollop of mayonnaise & my own jar of delicious tomatoes etc in a fabulously flavoured oil!!! All this was served on the most beautiful rough wooden board......mmmmmmmmmmmm...I was in heaven!! My thoughts are turning towards summer! Oh dear, I can ramble on can't I? 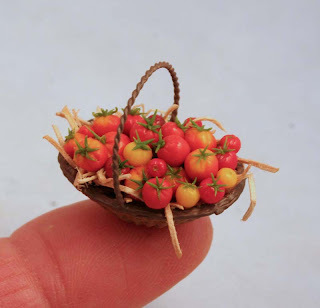 The whole point of this was to show you a basket of greenhouse tomatoes....I'm hoping that this year my "real" ones do better than they did last year. Like the beans, squashes etc, right now they are on my very crowded windowsills...waiting for the danger of frosts to pass! They say that animals take after their owners...& now, I'm quite sure "they" are absolutley right!! I've been meaning to post this photo since last (Easter) weekend when, for once here in the North East of England, the weather was actually so good that I just had to forsake the mini sweatshop & head out into a garden full of winter neglect. As ever, though, the relentless commission work has kept me in the sweatshop all week, night & day...but AT LAST...I've very nearly finished the latest order so I thought I'd let you see how my hens ( & only one was keeping me company whilst I worked on my ponds that day! )make the most of the sun by sunbathing!! A HAPPY EASTER to everyone & a special welcome to my new followers..why you should want to follow my nutty ramblings remains a mystery!! :-)) A special welcome to Vicky...a fellow dweller in the grey & cold North East of England!! I decided that I'd had enough of Easter Eggs, Hot Cross Buns etc etc..ad infinitum & decided to bake (for "real"...shock horror! 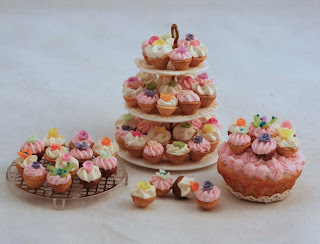 )...but, of course, having baked the full size, I then just had to replicate them in miniature, & FAST, while I still had the "real" thing in front of me( before I devoured them with my coffee!!) to look at whilst sculpting. My goodness...I had to work really fast before I ate the subject I was modelling!! As the baking bug (for real) took hold, I raided the freezer & used the last of the currant harvest from last year to make a yummy pie for pud last night &, yes, you guessed...a miniature version was just screaming to be made too!! If I EVER see another cupcake it'll be too soon! 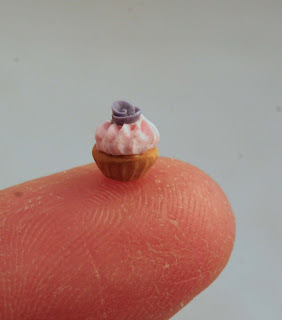 At last I've managed to get out of the mini sweatshop after 2 days & nights making cupcakes...I wouldn't care, I don't even LIKE the things in real life...so just what on earth drove me to make thousands of the damn things in miniature, I have absolutely no idea! Unfortunately, I had no choice as to how many I was making as it was a case of "not wasting" both the cake mix itself & the seemingly gallons of "icing" that I had made. I had hoped that in the space of two days, the icing mix might have hardened off too much to carry on...but, having experimented by keeping it in wet kitchen towel inside a plastic baggie, to my horror it stayed perfectly workable...so I had no choice but to plod on! These are just a small sample of the blasted "pretty" little things...But, HOORAY, Finally this afternoon, I finished both the "icing" & the cake mix...NO MORE cupcakes from this mini kitchen for quite sometime. I forgot to add that I also kept running out of the tiny roses to stick on the icing...never again! Imagine making what seemed like thousands of these!! I just can't believe that it'll be Easter in just over a week...where on earth does the time go? I definitely need to have another 24hrs added on to each day just so that I can get everything done that needs doing! The decorating has been put "on hold" & that's another way of saying that I doubt if I'll get the paintbrush & pasting board out for another few months! :-))The trouble is that for a change we are having some lovely weather, so I refuse point blank to be stuck inside while the elusive sun shines! So decorating is out of the window & grass cutting & clearing out my garden ponds is now top priority....as ever, I get SUCH a lot of help from he who shall remain nameless!! After all the physical exercise I've had today walking miles with a grass cutter whose power drive definitely has a mind of its own....I either find myself pushing it up an incline, or even worse, fighting to stop it as it gets ever closer to a tree or a wall! I have muscles aching tonight that I didn't know I had!...what I really need is an intake of Chocolate! 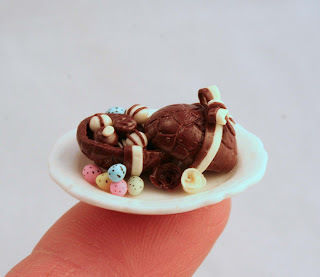 Horror of horrors though, the only choccie I could find in the house was a polymer clay Easter egg that I made a couple of weeks ago! Oh dear....I wonder whether "He Who Shall Remain Nameless" might be persuaded to pop out & buy me some that I can actually eat?? ?